Download "Domestics, Contractors, and the Homeowners Policy"
1 Domestics, Contractors, and the Homeowners Policy Along with an increase in the number of dual income households comes an increase in the number of people who avail themselves of a domestic servant. Whether it is a housekeeper who works in the home while mom and dad are away at jobs or a live-in nanny arrangement, paramount on the minds of the homeowner should be knowing what insurance coverage is available in the event of injury to the domestic worker. 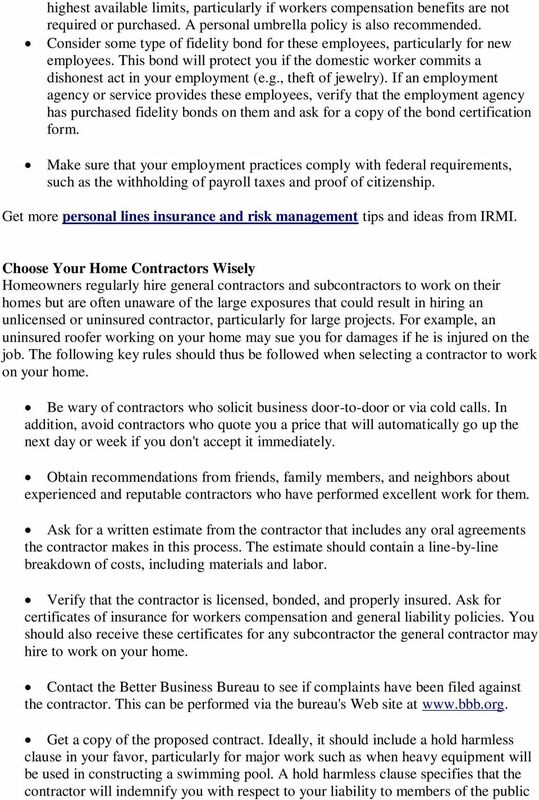 Add to this situation independent contractors such as plumbers, yard care personnel, or roofers who find themselves on the premises of the homeowner and the typical homeowner finds himself facing an injury and/or lawsuit exposure. This article examines what coverage is provided by the standard Insurance Services Office (ISO) homeowners policy for such situations. 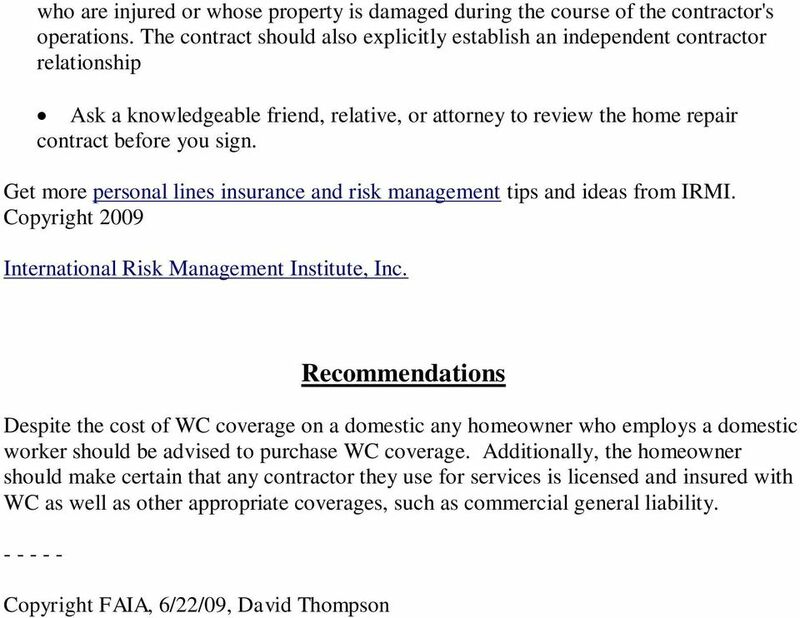 The 04/91 and 10/00 edition dates of the homeowners policy are identical in the coverage provided. 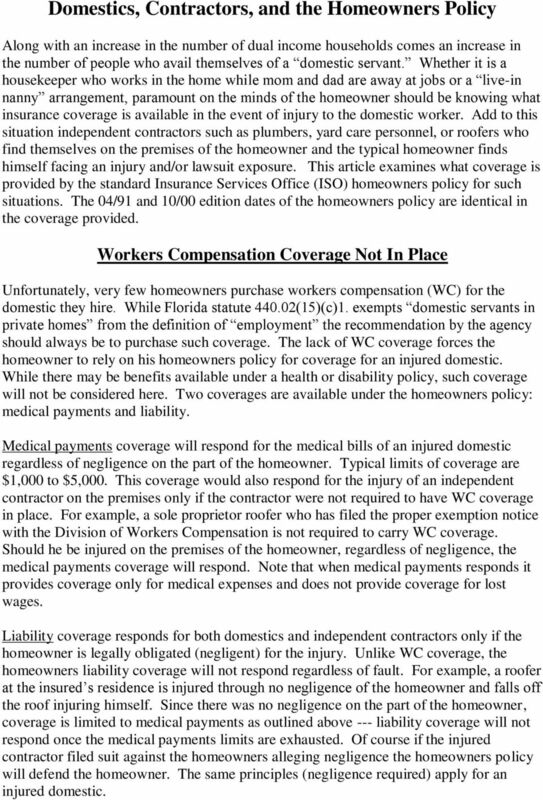 Workers Compensation Coverage Not In Place Unfortunately, very few homeowners purchase workers compensation (WC) for the domestic they hire. 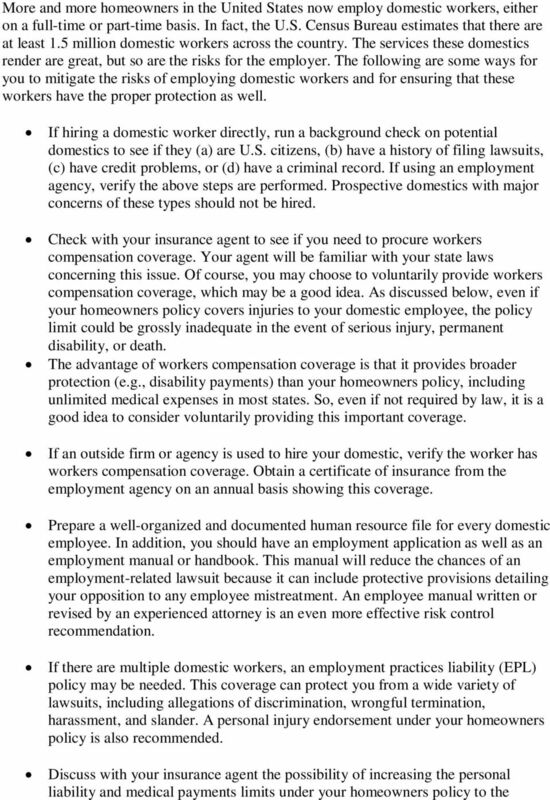 While Florida statute (15)(c)1. exempts domestic servants in private homes from the definition of employment the recommendation by the agency should always be to purchase such coverage. 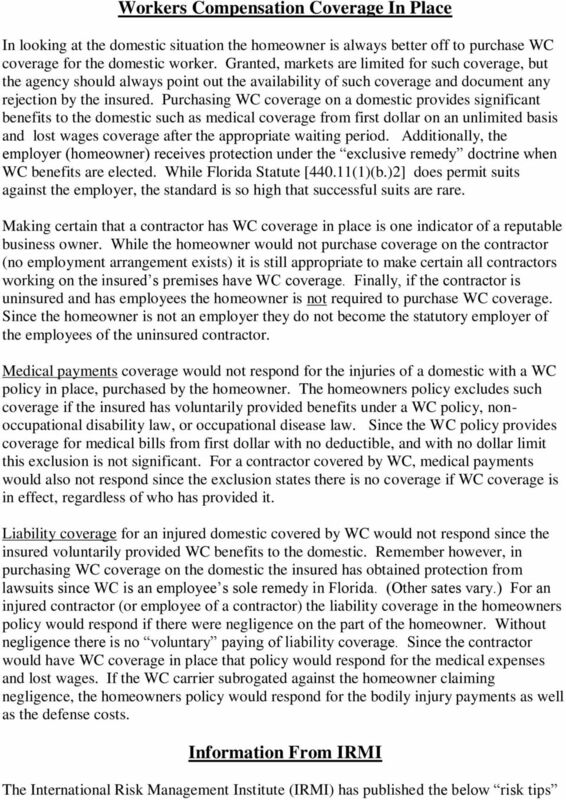 The lack of WC coverage forces the homeowner to rely on his homeowners policy for coverage for an injured domestic. While there may be benefits available under a health or disability policy, such coverage will not be considered here. Two coverages are available under the homeowners policy: medical payments and liability. Medical payments coverage will respond for the medical bills of an injured domestic regardless of negligence on the part of the homeowner. Typical limits of coverage are $1,000 to $5,000. This coverage would also respond for the injury of an independent contractor on the premises only if the contractor were not required to have WC coverage in place. For example, a sole proprietor roofer who has filed the proper exemption notice with the Division of Workers Compensation is not required to carry WC coverage. Should he be injured on the premises of the homeowner, regardless of negligence, the medical payments coverage will respond. Note that when medical payments responds it provides coverage only for medical expenses and does not provide coverage for lost wages. Liability coverage responds for both domestics and independent contractors only if the homeowner is legally obligated (negligent) for the injury. Unlike WC coverage, the homeowners liability coverage will not respond regardless of fault. For example, a roofer at the insured s residence is injured through no negligence of the homeowner and falls off the roof injuring himself. Since there was no negligence on the part of the homeowner, coverage is limited to medical payments as outlined above --- liability coverage will not respond once the medical payments limits are exhausted. Of course if the injured contractor filed suit against the homeowners alleging negligence the homeowners policy will defend the homeowner. The same principles (negligence required) apply for an injured domestic. Minimum Insurance Requirements for Construction, Non- Construction, Consultants and Professional Design Contracts Highlights This site is informational. It does not supersede our construction contract. domicile, including but not limited to Personal Injury Protection (PIP) and Personal Property insurance (PPI), must be carried. INDEPENDENT CONTRACTOR SUPPLIER AGREEMENT. and include your affiliates. We, us, our, and ours refer to ConSol Partners, LLC. Client refers to. Business Insurance. AKD Consultants Adam Dworkin CPA 188 Whiting Street Suite 10 Hingham, MA 02043 781-556-5554 Adam@AKDConsultants. K YROUS R EALTY G ROUP, I NC. The West Lafayette Engineering Department is requesting quotes for sidewalk repairs needed in the Barbarry Subdivision. Hiring or. Becoming an Associate. Are you ready to expand your practice? or Are you looking for an associate position? Alterations to Building Request Form This form is required for all Organizational Housing Facilities that wish to request any changes, updates, or overall alterations to the facility or surrounding area. III. The contractor s status pursuant to the contract shall be that of an independent contractor and not an employee of the University. Gordon L. Mountjoy & Associates, Inc.
INSURANCE REQUIREMENTS CHECKLIST Submit an Acord 25 form and the endorsements as required below. Your insurance must be in compliance immediately after you sign your subcontract and before you start work. $1.395 million settlement for electrocution of unlicensed contractor Papazyan v. Chia et al. Questions to ask... As a multi site Facility Manager hiring the right HVAC contractor can be a daunting task. Number 2014-17 September 2014. INDEPENDENT CONTRACTOR or EMPLOYEE?